Malaria is a disease caused by parasites that are injected into a person’s blood stream. A common example of this would be a mosquito with parasite biting a person. When someone gets infected, malaria symptoms often display as a flu-like illness, accompanied by chills, intense shivering and high fever. Cases in the United States are usually reported from travelers who have gone abroad to countries where malaria is prevalent. These countries include, but are not limited to, South Asia and sub-Sahara Africa. This serious disease can sometimes become fatal. Even so, illness and death can still be prevented. Symptoms caused by malaria can range from mild to deadly. The disease is split into two different categories: uncomplicated and severe. Malaria parasites infect the body, causing anything as simple as the chills and fever to as complicated as organ dysfunction and shut down. Depending on the type of malaria a person is infected with, an individual can have periods of well-being. If signs of malaria are present, a person should see a doctor to determine if they have been infected. This is especially important if someone has travelled from a malaria stricken area. Malaria symptoms typically show between 10 to 35 days after infection. The disease is considered uncomplicated when the symptoms are not considered severe and vital organs are unaffected. When it is uncomplicated, the malaria attack usually lasts between 6-10 hours. Symptoms of malaria usually present as a combination of fever, headache, sweating and/or chills, vomiting, nausea and body aches. Sometimes the attack will show up in stages. The cold stage is when a person has the sensation of being chilled and will shiver profusely. The hot stage is when there is a high fever and possibly vomiting. The sweating stage occurs when a person’s temperature returns to normal, leaving the individual very tired and sweaty. Malaria is considered severe when there is serious organ dysfunction or when lab work indicates abnormalities in a person’s blood. Signs of severe malaria are indicated by life-threatening symptoms. Individuals may experience fluid accumulation in the lungs, which causes breathing difficulties, organ failure, swelling of blood vessels in the brain, seizures or coma, low oxygen intake and anemia. These severe symptoms are considered urgent and individuals displaying them should receive medical emergency care immediately. Malaria is caused by parasites entering an individual’s bloodstream and is most commonly transmitted by mosquitos. The transmission cycle starts off with an uninfected mosquito biting and feeding on an individual who has malaria. When the mosquito bites another person, the malaria parasites are transmitted. The parasites travel in the bloodstream, ending up in the liver. They can lie dormant in the organ for up to a year. When mature, the parasites leave the liver, reenter the blood stream and infect a person’s red blood cells. This is the stage of transmission when malaria symptoms start to develop. 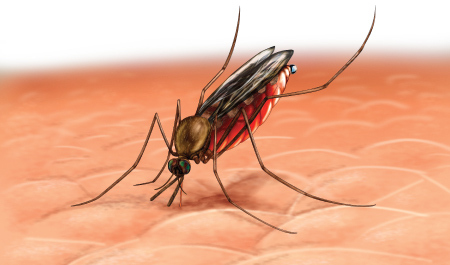 The cycle starts over if an uninfected mosquito bites the recently infected individual and then spreads it like before. Besides entering the bloodstream via a mosquito bite, malaria can be transmitted by exposure to infected blood. Means of parasite transmission includes sharing needles for intravenous drugs, a mother infecting her unborn child, and contaminated blood transfusions. There are two main treatments for malaria: medication and blood transfusions. A combination of antimalarial drugs are used to treat the symptoms of malaria. Included are medications that control fever, fluids, electrolytes and seizure. Depending on how severe the malaria presents itself and how likely a chloroquine resistance may occur, different types of medications will be administered. The types available include, but are not limited to: Chloroquine, Hydroxychloroquine, Quinine, Artemether, Atovaquone and Lumefantrine. The quickest way to remove parasites is blood transfusion. This procedure is considered an option if an individual’s condition severe. A patient will probably qualify for a blood transfusion if parasites have infected more than 10% of blood cells, or if the patient is experiencing kidney or lung complications. During the blood transfusion, blood is withdrawn from the patient at the same time as blood from a donor is injected. The procedure is carefully monitored as the amount of blood in the patient’s body needs to stay constant. An individual can take several precautionary measures in order to avoid infection from malaria. First of all, if planning to travel to areas in the world that are known for malaria infections, it is important to take preventative medications like Doxycycline, Malarone and Larium. Secondly, it is important to try to avoid mosquito bites. Methods of bite prevention include covering as much of a person’s body as possible with clothing, staying indoors (especially at night), using insect repellent that contains picardin or DEET and using mosquito nets and bed nets when possible. Visit here to get more information on countries that pose a greater risk to travelers in terms of malaria.